Senior politicians from the Labour, Liberal Democrat and Green parties joined campaigners in delivering a petition asking transport secretary Chris Grayling to rethink his decision to scrap the UK’s rail electrification programme. 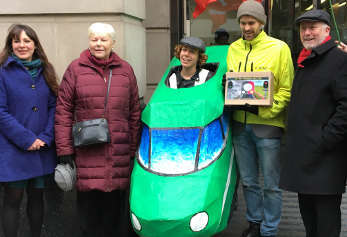 The petition, signed by over 14,000 people, was organised by 10:10 Climate Action and Campaign for Better Transport (CfBT) and was handed in to the Department for Transport on the morning that Mr Grayling launched the Government’s Strategic Vision for rail. Mr Grayling’s decision to scrap the electrification of rail lines in south Wales, the Midlands and the Lake District was announced in the summer and was widely criticised. Supporters of rail electrification say it is vital in tackling air pollution and climate change targets and reversing long-term underinvestment in transport infrastructure outside London and the South East. On Wednesday Mr Grayling again defended his position on the grounds that it could mean spending £1bn to shave a minute of journey times and that bi-mode technology makes full electrification of routes unnecessary. Andy McDonald MP, Labour’s shadow transport secretary, said: ‘The Government should stop pretending that “bi-mode” trains mean electrification is no longer necessary. Bi-mode trains either operate as underpowered diesel trains or overweight electric trains. CfBT chief executive Stephen Joseph said: 'It's ironic that as progress is being made on the UK's roads away from polluting diesel towards cleaner electric vehicles, the Government is turning back the clock on our rail network and condemning cities and towns along these rail lines to years more of dirty air.